red colourpoint female born in Holland. Sissy has a very sweet personality. she comes on my back and kneads there with a lot of purr. Sissy likes to talk a lot with her tiny voice. It is very difficult to take photos of her, because she just can not sit still and pose. of the cats. Sissy is a real gourmet: her favourite dish is shrimps or ShinyCat cans. 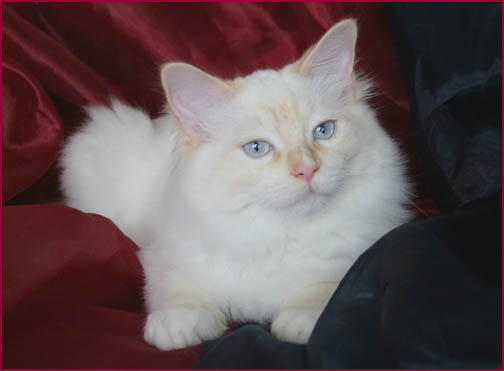 Anis is a young female from the first Sunrunner's litter. 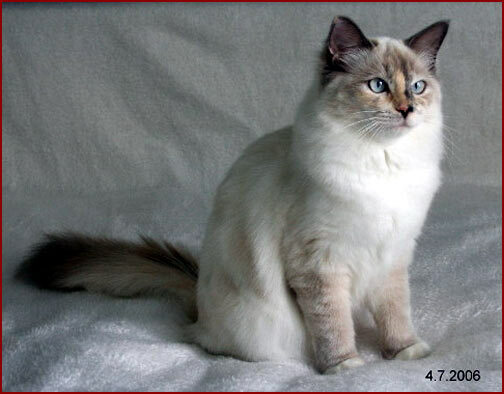 She is a nicely marked blue tortie mitted with an interesting looking split face. Anis seems to develop to a good sized female with a very heavy but long body structure. 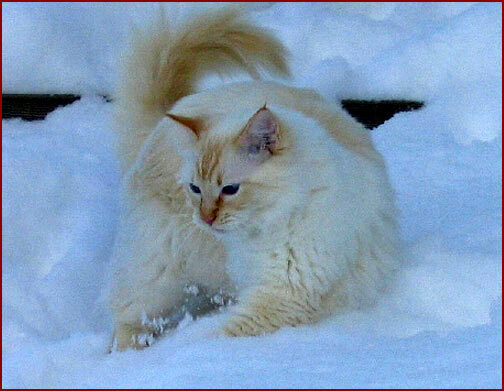 Her coat quality is what a ragdoll really should have: the exactly right silky texture. which was long, sunny and very warm. 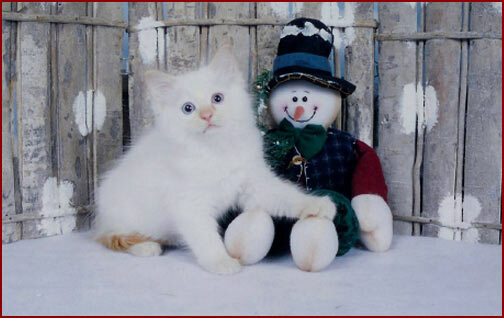 She is very playful and has enjoyed a lot of the running games with her new "little brother", Mikko the Persian. One of her favourite hobbies is eating. Hertta is a sweet young bicolour girl, the colour and pattern I have been dreaming of a long time. Hertta is a grand daughter of my Sepi. She comes from Bluemellow's cattery in Germany. 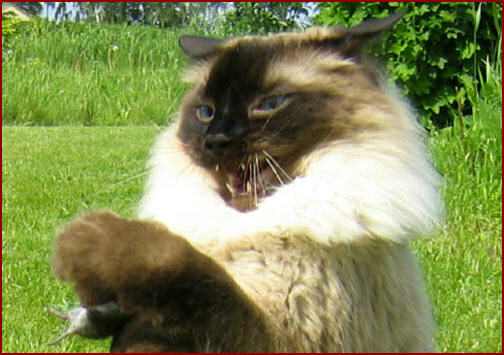 Tito is my very first Ragdoll and he moved to Tuusula in May 1999. I took a week off from work, as I do always do when I have a new cat. Tito started to grow very fast and he grew up to a very big male. in a cat show some day. Eventually Tito has achieved the title of FIFe Europa Premior. Tito is a very large and very intelligent cat and he knows what he is. and rescued their fellow bird. Tito has experienced a lot, among other things performing in a live TV show in spring 2002. You can read a story about this exciting day on TV here. 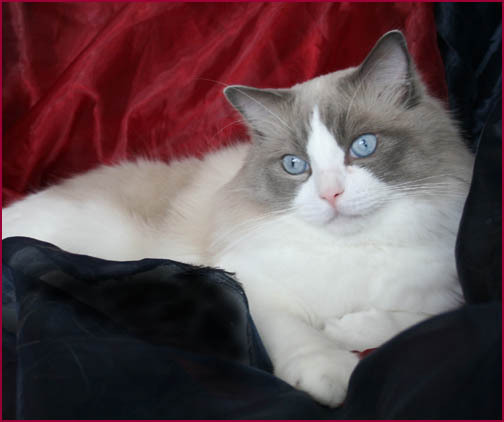 I had a dream of having a blue bicolour as my second Ragdoll. As Sepi is seal the dream was waiting for to come true. I found a very sweet blue bicolour kitten in Hobbit-Dolls cattery. The baby boy got his name Jussi and I call him Pikku-Jussi (Little Jussi), because my first Persian was also called Jussi. Pikku-Jussi follows me all the time. If I walk from one room to another it takes only a second that he is also there. Sometimes he is faster than me and I almost fall down, when he is in my feet. Pikku-Jussi's special hobby is climbing on the net walls in the cat pen. Pikku-Jussi has been a stud boy, but is already neutered. in my own cattery with The Nordolls Sunrunner Sioned. Pikku-Jussi has been tested against PKD (PKD-neg) and HCM (HCM-neg). His blood group is A. In late spring 2003 a Dutch breeder friend Marian Groenendijk asked if I could help her to find a nice name for one of her first red kittens. It should contain the word "sun". So I send her a suggestion: how about Sun-Runner's Fire. I never thought that this kitten would be mine in a couple of months. Marian came to Finland to a cat show in early August and took Sunrunner with her to the show. After the show we decided that he will stay with me in Finland. His name was changed to Rane which suits better to a Finnish mouth. Rane is really what his name tells: a very sunny character - always happy and friendly-and a good runner too. Rane is a neutered boy, because unfortunately he has a tiny imperfection in his tail tip. But Rane is happy as a neuter, free from all the trouble women cause. he escaped from his Sherpa bag in the plane!